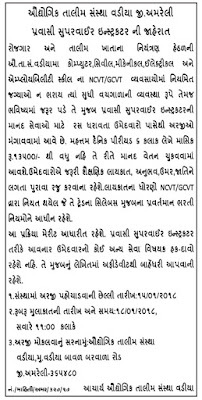 Industrial Training Institute - ITI, Vadia published an official notification for Recruitment of Pravasi SupervisorInstructor Eligible candidates can apply for this recruitment. You can view more details about this recruitment including No. of posts, name of post, Educational qualification, Age limit, Selection process, How to apply etc... You can also view official notification and other important facts about this recruitment e.g. Important links and Important dates. ITI Supervisor Selection Process: Final selection will be based on Interview. address along with necessary documents.